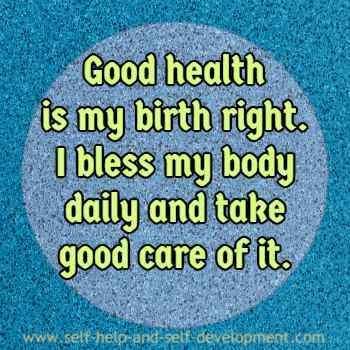 Health is wealth and positive health affirmations are the key to this wealth. When the mind thinks health thoughts, the body finds it easier to be healthy. Even diseases caused by germs can be termed psychosomatic in the sense that germs are allowed to enter into the body or existing germs in the body become strong enough to cause the disease because the immune system of the body is lowered due to emotional reasons. Emotions are controlled by thought and thoughts can be formed at will. Affirmations help to mould thoughts. Thus, the connection between affirmations and health becomes clear. It is often said, “Change your thoughts, change your life”. 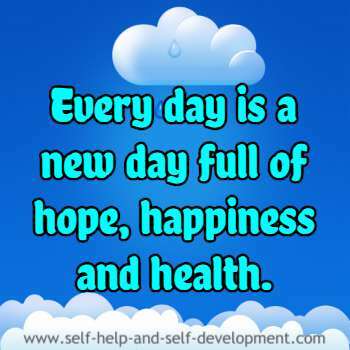 It is possible to fill the mind with health thoughts by using positive health affirmations. Repeating these affirmations over and over impresses the subconscious mind to such a degree that it slowly starts transforming the body to align with the health thoughts. Even dreaded diseases like cancer have been conquered by thought power. The placebo effect in medicine is purely psychological. In this, a patient, instead of being given a real medicine is given a sugar pill but is told that this is real medicine to cure his medical condition. And cure it does! The fact is that it is not the placebo that cures the patient but the patient’s mind that does it. Affirmations for good health can do similarly wonderful things for the body. Here is a very informative article that explains the connection between mind and body beautifully. 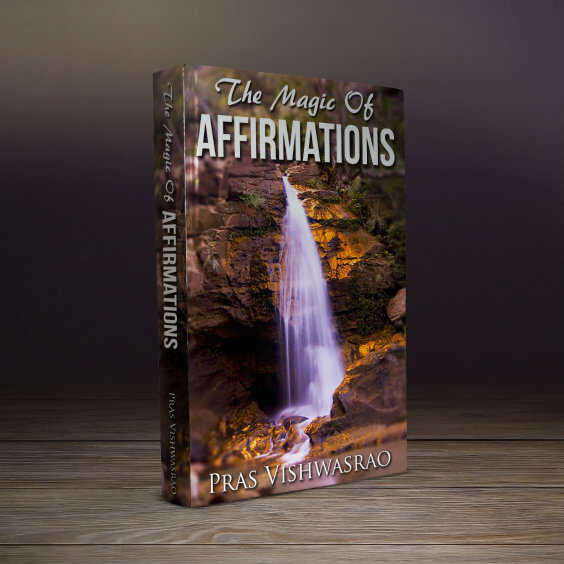 After reading the article, you should be convinced of the importance of positive affirmations for health. There is also medical evidence now that different chemicals are produced in the body when there are different emotions in the mind. When one is happy, such chemicals are produced as are beneficial to the body. When one is sad, such chemicals are produced as are harmful to the body. Thus, thoughts affect the body. It is clear that positive affirmations for health can have only positive effects on the body. A list of health affirmations follows. 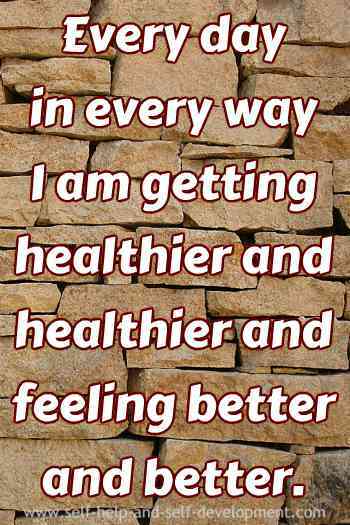 Select a suitable health affirmation and repeat at least a hundred times daily for six months. Do NOT discontinue medication if any that your doctor has prescribed. Affirmations complement medicines, not replace them. Affirmations strengthen the mind, change the direction of thoughts for the better and help the body to better health. of water that cleanses my body. 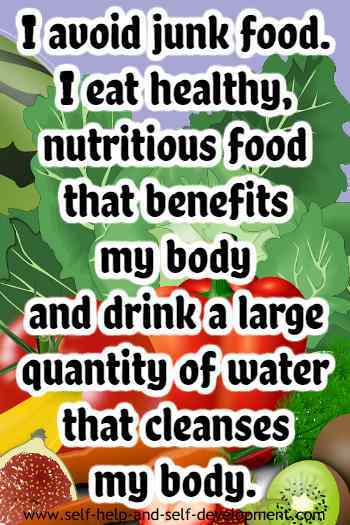 Every cell in my body is health conscious. I am a health freak. As a result, my body feels good and I radiate good feelings. 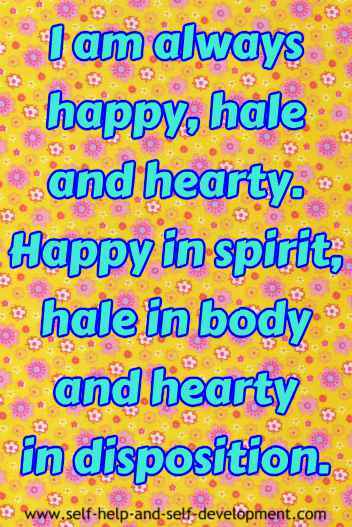 I am always happy, hale and hearty. Happy in spirit, hale in body and hearty in disposition. To me, good health is next only to Godliness. 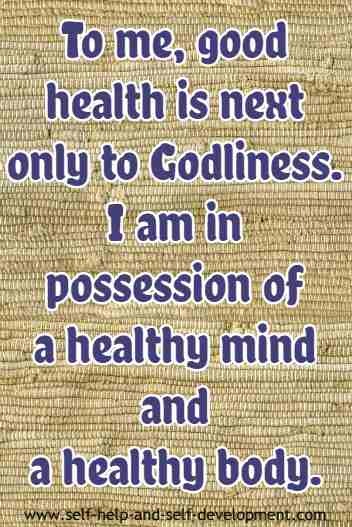 I am in possession of a healthy mind and a healthy body. I am of a strong heart and steel body. 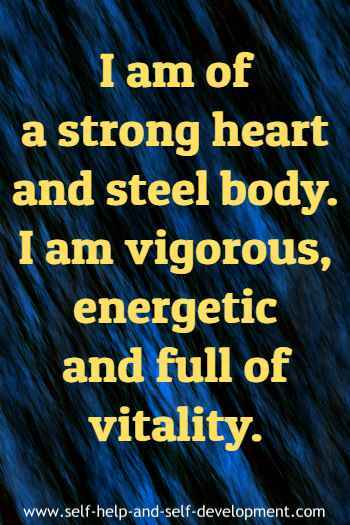 I am vigorous, energetic and full of vitality. about people, incidents and anything else. 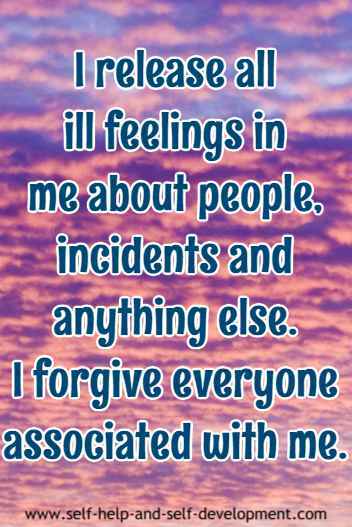 I forgive everyone associated with me. Every passing day my body becomes more energetic, more healthy. I treat my body as a temple. It is holy, it is clean and it is full of goodness. I am free of diabetes, free of blood pressure problems and free of all life threatening diseases. Healthy, wealthy and wise is my motto. My body is healthy, I am wealthy and my mind is wise. I am my own creator. I am the One and I am the All.